The home video market exploded in the 80s and to this day is still going strong, though the delivery channels have certainly changed. First it was VHS and Beta tape, then DVDs, and now a hybrid of DVD Blu-Ray and Video On Demand (VOD). Regardless of the delivery channels though, one thing is clear, the future for independently-produced content is bright. From episodic narrative films to special interest content, with the right approach and a lot of hard work, anyone with a great idea can be successful in this space. From exercise and wellness to corporate conferences, at IDM we have been fortunate to produce a number of titles that have met with critical acclaim. Be it only production, or working with our clients all the way through packaging and distribution, we can work with you to make sure your next DVD or VOD title is a success. Lee Holden is an internationally known instructor in Qi Gong meditation, and Tai Chi. In collaboration with Grand Master Mantak Chia, one of the foremost Qi Gong experts in the world, Lee has been instrumental in bringing ancient Taoist teachings to western culture. ​We worked with Lee and publisher Exercise To Heal to produce his second set of DVD programs, a 7-part series shot on location in South Lake Tahoe. We handled all pre-production, production and post-production responsibilities, as well as all DVD authoring and package design. A number of the titles eventually made their way to PBS, where we worked with Lee and ETH to support three national PBS pledge programs. ​Click on the program sample to the right to watch the "7 Minutes of Magic" introduction. And to take a look behind the scenes of the production, click here. To see the entire DVD series visit ExerciseToHeal. “Qi Gong for Health and Healing” is a title we produced with Lee Holden and publisher Sounds True. 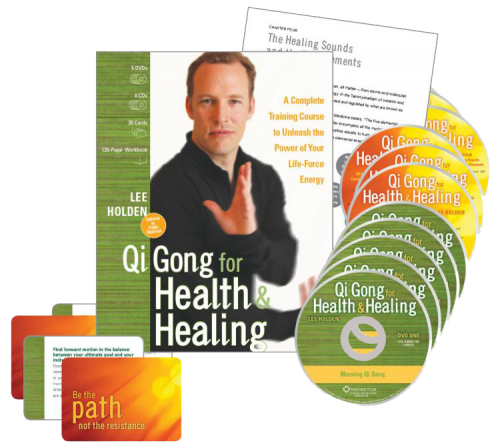 The program consists of five DVDs, including six hours of foundational exercises for morning, evening, self-healing, emotional balance, and spiritual Qi Gong. We took on all pre-production and production responsibilities. Sounds True handled post production, DVD authoring and packaging. Other titles generated from this production included Qi Gong AM/PM Workout and Qi Gong for Self-Healing. We were thrilled to shoot this in football legend John Madden’s studios in Northern California. ​Click on the program sample to the left to experience the introduction to the AM/PM title. And to take a look behind the scenes of the production, click here. To see the entire DVD series visit SoundsTrue. ​​During the aerobic video boom in the early 90s we produced the critically acclaimed “All Out Total Body Workout” with 2x Aerobic National Champion Teri Wexted. The 90-minute low-impact aerobic workout was the best-reviewed video of 1991, garnering top nods from such publications as Self, Shape, Good Housekeeping and Family Circle magazines, USA Today, and others. Based on funk aerobics, the video was praised for its originality, innovative production techniques, and Wexted’s charismatic personality and energetic delivery style. Our responsibilities on this program included everything from pre-production through distribution, forming the company All Out Fitness Productions to handle the work. A special 25th Anniversary release of the title is planned for 2017, giving people the chance to once again experience the late 80s/early 90s, complete with neon colored spandex and funky retro dance moves. ​​DVD programming isn’t just for the consumer home video market. Businesses of all sizes are constantly developing programming for their clients that is professionally produced and uniquely packaged for a wide variety of audiences. Be it conference coverage, or just a simple product demonstration video, companies big and small are often in need of well-designed VOD and DVD programming that they can share with their VIP customers. When Schwab Funds needing such programming they called on us. Holding a three-day investment conference in Colorado Springs for their marquee clients, Schwab turned to our team to produce coverage of the entire event. We created a 4-disc DVD set that Schwab provided as a gift to every conference attendee. The three-day event included not only outstanding presentations from top industry analysts, but an intimate conversation with Chuck Schwab himself, and a very special inspirational keynote speech by Olympic Speed Skating Gold Medalist Dan Jansen.